“Hey Football Gods, if you wanna bring Adrian Peterson to Denver I wouldn’t be mad,” Broncos fan Parker Browning tweeted in the moments after the Vikings announced Tuesday they would not exercise the 2017 option on the star running back’s contract. Football fans, analysts and writers began speculating and dreaming while reacting to the news that could mean the end of Peterson’s career in Minnesota. Don’t say goodbye just yet. The Vikings press release and statement from general manager Rick Spielman indicated the team would continue to have conversations with Peterson’s representation to determine what is best for both parties. Many of the football analysts sounding off on Twitter Tuesday afternoon also alluded to the possibility Peterson will stay in Minnesota. However, others share the opinion that Peterson will continue his career elsewhere. Some of the regularly mentioned destinations are Tampa Bay, Kansas City, the New York Giants, New England, Green Bay, Oakland and Seattle. 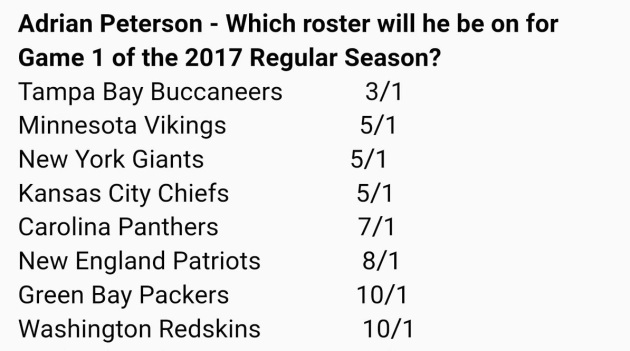 Oddsmakers at Bovada, the online betting website, predict Tampa Bay as the 3-to-1 favorite to land Peterson. The Vikings, Giants and Chiefs have 5-to-1 odds. Carolina has 7-to-1 odds, New England 8-to-1, Green Bay and Washington 10-to-1, Oakland 12-to-1, Seattle 14-to-1 and Philadelphia 20-to-1. Think the Bucs make more sense for Adrian Peterson than the Giants. Don't see the Patriots signing him. I'd love to see Adrian Peterson sign with the Patriots and win the Super Bowl here at US Bank Stadium. Not to be lost in Adrian Peterson equation: Giants RB coach Craig Johnson knows Peterson from Minn. Johnson was Vikings QBs coach 2011-13. Brace yourselves. Here come the Adrian Peterson to the Seahawks narratives. Throwing this out there...SB champ #Patriots could possibly get Adrian Peterson (on friendly deal) & No. 1 NFL Draft pick & lose 0 starters. At least my 3 Adrian Peterson jerseys will be ironic throwbacks in about five years. Can't wait to find out where Adrian Peterson spends his "Emmitt Smith on the Cardinals" years. The Cowboys pursuing Adrian Peterson makes about as much financial/depth chart sense as the Cowboys keeping both Tony Romo and Dak Prescott. Not one Adrian Peterson question. I've never been more proud of Cardinals fans. The Browns are at the bottom but no one in Berea is calling about old head Adrian Peterson. Tony Romo and Adrian Peterson are expected to sign with the Cleveland Cavaliers, sources say via LeBron James. Mumps and the NHL: Why is this happening (again)?